The Dutch Minister of Justice Mr. Dr. E.M.H. 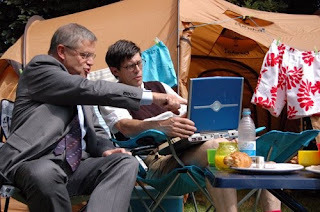 Hirsch Ballin, pictured here on the left, recently launched the Safe Internet campaign. Update software and turn on your firewall. Always check the web address before your engage in any payment transaction. Handle your personal data with care. Never open electronic files instantly. Be alert to contacts who send in proposals or ask for data. Google and YouTube support this public campaign and have signed up as partners. We share the goal of making the Internet safe, fighting malware and working to maintain online security. For more information and recent blogposts on all the different actions that Google has taken, check out the Google Online Security Blog. Also YouTube Safety Center allows users to to flag concerns they have regarding uploaded video's and comments, relating to spam and phishing, harmful, dangerous and hateful content. See for more information the video of the launch of the public campaign or visit the YouTube channel of the Ministry of Justice.